• Over 1,000,000 people in the United States visit the emergency room each year due to a slip and fall accident – The number of people in the United States that require emergency medical attention due to a slip and fall each year is over a million, and this only includes those who seek emergency medical treatment. Often, because some injuries don’t cause symptoms until later, those who suffer a slip and fall accident may not seek emergency medical attention and instead visit their personal care physician later on. While over 1 million go to the emergency room, the number of people who suffer these injuries each year is likely much greater. • Average cost of $30,000 – On average, a slip and fall accident will cause around $30,000. This type of cost can devastate families, making the ability to seek compensation important. • A bone is broken in 5% of all slip and falls – Broken bones aren’t just painful, they’re also expensive, and a bone is broken in 5% of all slip and fall accidents. 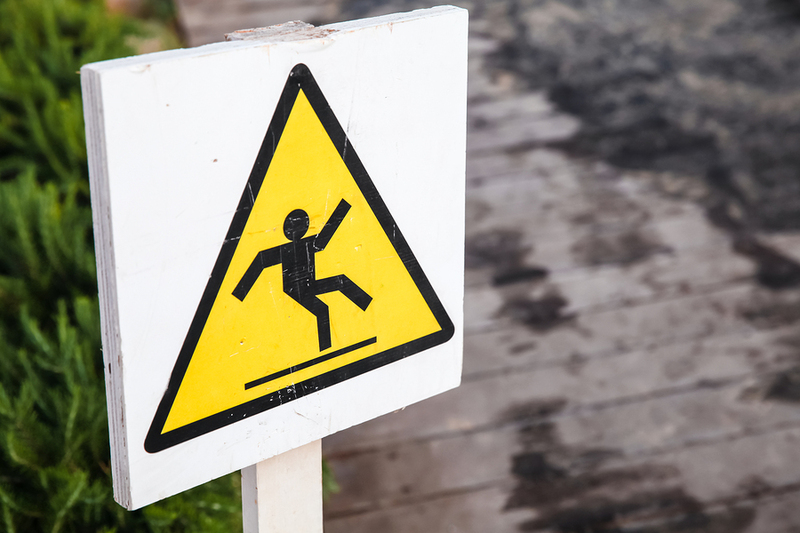 Around 20% to 30% of slip and fall accidents cause a serious injury not related to a broken bone. • Each year, approximately 1/3 of seniors over 65 are involved in a slip and fall – For older Americans, a slip an fall accident is likely to cause more serious injuries. Every year, 1/3 of seniors aged 65 and over are involved in a slip and fall accident. • Leading cause of injury for all age groups – While slip and fall accidents to seniors over 65 may have more serious complications, this type of accident is a leading cause of injury for people of all ages. For people aged 10 to 24 years old, it’s the second most common cause of non-fatal injuries. • The most common cause of brain injury – Car and motorcycle accidents aren’t surprising causes of brain injury, but slip and falls tend to be, even though they’re the most common cause of brain injury. When a person slips, hitting their head on a wall, a window, the ground, or another hard surface is easy to do, and this is all it takes to suffer a TBI. • $34 billion in medical costs – Each year, slip and fall accidents cause Americans an average of $34 billion. With the average slip and fall costing around $30,000, one can see how devastating the financial damage can be while trying to recover from your accident. • Slip and fall accidents cause sufferers to miss an average of 11 work days – While racking up medical bills, it’s difficult to pay for them when you’re unable to work. The average slip and fall accident will cause American workers to miss an average of 11 days of work. These missed work wages are another expense victims may be able to seek compensation for.